Wonderful Beyond is the latest, fourth solo album as Astral Son by psychedelic musician and painter Leonardo from Groningen, The Nerherlands. I have really enjoyed his previous albums that have all been released on limited vinyl by Headspin and this one is no exception. This is the third one to also get a CD release on the marvelous Sulatron Records and the CD version includes also one bonus track "Quiet Love". The production values are now higher than before, not that the earlier output had sounded bad by any means. You can still sense a certain home-made, pleasant vibe on this album. As before, the album includes everything from acid folk to psychedelic space rock, experimental electronics and Eastern-tinged ragas. "She" is a slow and heavy psyche/krautrock track somewhere in between Amon Düül II and Sun Dial. What a great, trippy and spacey tune! The hypnotic "Matrix of Creation" is closer to Steve Hillage or Gong and another winner. "Time and Space" is an acoustic, peaceful piece including also bird-song. "Your Mind" again brings to mind Hillage/Gong in a good way. On "Moving Slowly" we get to take it easy. "The Universe" is a more experimental, mantra-like track with cool narration and backwards guitar. "Cheap Magic Spells" is the longest track on the album at almost seven minutes. This melodic song sort of sounds like a mix of early The Bevis Frond and Ethereal Counterbalance, very nice. "Nothing New" is a bluesy track and "The Well" again brings to mind Ethereal Counterbalance a bit. Great psychy solo guitar work on this one! "Journey" is a hypnotic, heady instrumental and "Morning Dew" a mystical, weird piece that ends the vinyl version in a hazy manner. The CD bonus track "Quiet Love" is a pretty space ballad. 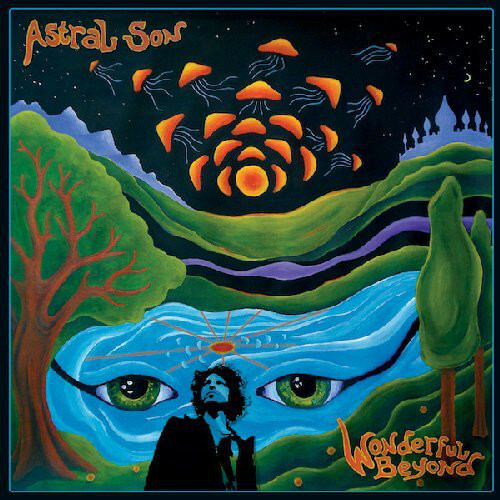 This is absolutely another killer album by Astral Son, maybe the best yet! Astral Visions Mixcloud Show #83 now online!